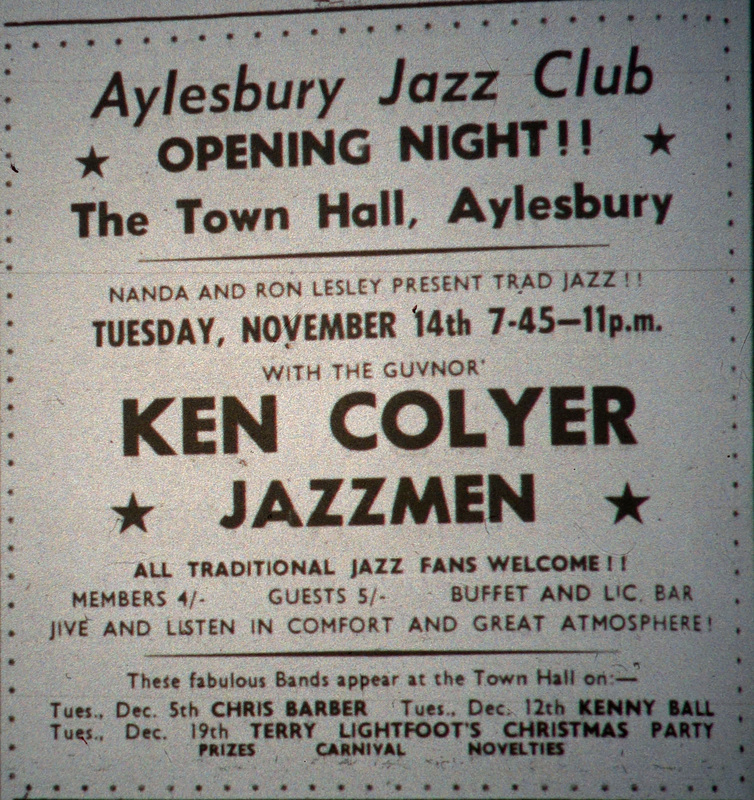 1961 saw the Aylesbury Jazz Club continue to thrive on Tuesday evenings – but there were some changes. 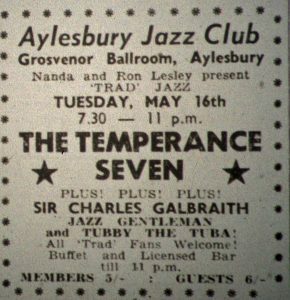 Toward the end of the year it was announced that the jazz club was changing venue, from the Grosvenor Ballroom to the Town Hall. The Temperance Seven’s single You’re Driving Me Crazy, produced by George Martin, was at number two in the charts, and went to number one the following week. After using the Grosvenor Ballroom, Aylesbury, as it’s headquarters for nearly three years, Aylesbury Jazz Club is quitting this venue and moving down the road, under the arches to the Town Hall. The move will take place on Tuesday, November 14, and first man in will be the “Guv’nor”, Ken Colyer. Why the move after so long? Let the club’s host, Ron Lesley, explain. “A better hall, and better facilities for my members”. The one big question is, of course, that of capacity crowds. In the past, when Barber, Bilk or Ball have been to the Grosvenor, the number of fans has been in excess of that which will be allowed at the Town Hall. The Town Hall has a maximum of 660, but Ron is not particularly worried. “My average weekly crowd is about 350, but Chris Barber is the next big name to come to Aylesbury. He has been contacted and says he does not mind the 660 ceiling”, says Ron. The lease-holder of Aylesbury’s Grosvenor Ballroom, Edward J. Friday, was fined £10 and ordered to pay £1 costs at Aylesbury court after being found guilty of failing to keep unobstructed exits, passageways and gangways in the ballroom. The court was told of a visit by Aylesbury Borough Council’s senior building inspector, a police inspector and a fire officer to the Grosvenor during a jazz club session on Tuesday, July 25. The building inspector, Mr. Geoffrey Edwards, said he was told that 551 people had paid for admission when he arrived. He inspected the premises and found all bar one of the exits were either chained and padlocked or obstructed by boards, or as in one case by a piano, blocking the passage leading to the doors. Friday denied in the witness box that he was responsible for the hall’s condition on jazz club nights. He claimed that on one occasion he wrote to Mr. Lesley and reminded him of his responsibilities with regard to keeping all the fire exits open when the ballroom was being used. Mr. Miscampbell, addressing the magistrates, said the crux of the matter was who was in charge of the ballroom on this particular night. Mr. Friday, he said, rented the Grosvenor Ballrooom from the freeholders. The freeholders were not held responsible for the exits when Mr. Friday was present, so why should Mr. Friday be held responsible when he was not there, but the ballroom was rented from him. This episode may have soured the relationship between Eddie Friday and Ron Lesley. 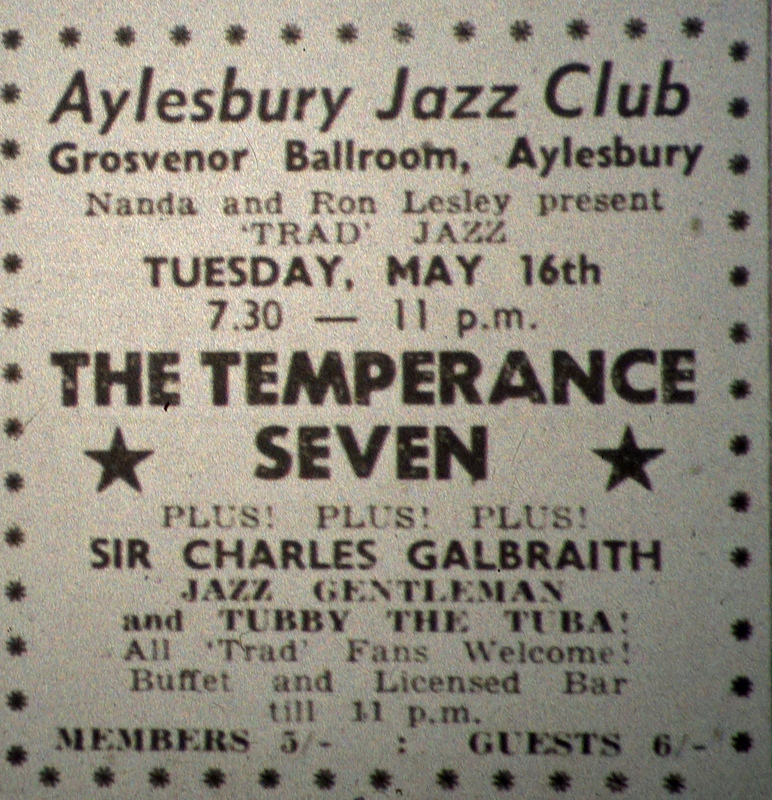 It is interesting that when the Town Hall was closed in 1962 due to a fire, the Aylesbury Jazz Club did not return to the Grosvenor – but instead moved to the Aylesbury Social Club in Park Street, only returning when the Grosvenor re-opened as the council owned Borough Assembly Hall in October 1963. 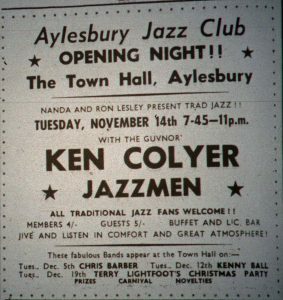 Details of the Aylesbury Jazz Club on Tuesday evenings in 1961 are shown below. There was also one all night jazz ball on 10th March – for details please see here.